While our Art Director Jesse Codling celebrates the big two-seven in Seattle, a 90 minute flight south to Berkeley the rest of us will be celebrating for him at Band of Horses and Admiral Radley. 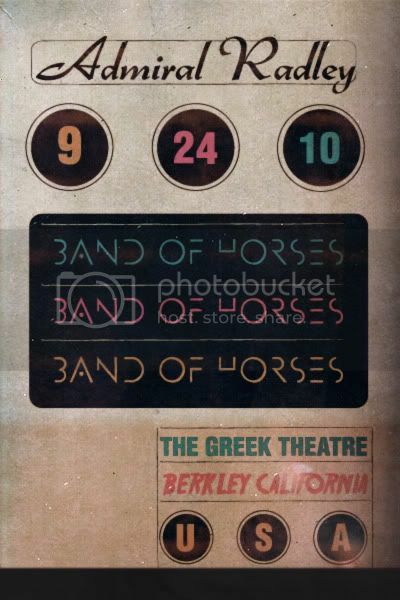 If there's one thing that FYM knows will be amazing, it's hearing one of the most epic songs of the past decade live: "The Funeral" by Band of Horses being heard in the best outdoor venue that the Bay Area has to offer at the Greek Theatre. Check out Ben Bridwell sans beard in this performance on Letterman. Admiral Radley, who has been on our boy William Sellers' radar for a while now, is opening the evening and "I Heart California" is working it's best to get on our top 10 songs of the year right now. Follow along with the video to practice your sing-along when you catch them this Friday at the Greek Theatre. The show starts at 7pm with Darker My Love opening the whole gig.